Wes Ellis: James 2:8 & 9: "Neighbor" and "Royal Law"
James 2:8 & 9: "Neighbor" and "Royal Law"
This passage offers just the sense of irony which, from what I know about the early church, defines the first Christians' approach to politics and their perspective not only on Rome's authority but on Israel's sense of what we now call "election." There are two things I want to think about concerning this passage. First, what is the contextual meaning of "neighbor" and how might the contemporary readers have understood it in contrast to their established and/or popular perspectives? Asking the question of the meaning of "neighbor" is a good hermeneutical habit to get into whenever the word is used in scripture, especially in conjunction with Leviticus 19:18. For example, when Jesus uses the term "neighbor," as he reveals from his famed parable of "the good Samaritan," he means pretty much anyone including those we wouldn't normally accept as neighbors... even Samaritans. Secondly, I want to think about the term "Royal law." Some commentaries expound upon the meaning of this term but I have not yet discovered in a commentary the sense of irony which I caught upon first reading and still suspect would have been detected by the first readers of the text. Within the context of James 2, the term neighbor would have challenged both Jewish and Roman conceptions. The religious Jewish people had a sense of election from which gentiles were traditionally and theologically excluded. Thus favoritism would probably have been a struggle for early Jewish Christians who were still trying to understand their faith in God's Holy Spirit who, through Christ, accepts all who come by faith. Therefore there may be a sense of this kind of favoritism, necessitating the congruent meaning of the term "neighbor" as reference to gentile neighbors, in the background or the foreground of this text but at the heart of the text is favoritism for the rich over the poor. The first readers of the text, newly dispersed from Jerusalem and surrounded by pagan/Roman society, found themselves in the minority and hardened by the temptation to establish their religion amongst the surrounding society. Their religion started to become more rhetorical than anything else, it became about words of persuasion rather than action on behalf of the poor. This is what prompted the author's rather pointed statement; "if anyone considers himself religious and yet does not keep a tight rein on his tongue, he deceives himself and his religion is worthless." Their favoritism is linked to this. If their goal is to establish their religion--to gain respect among the pagans--their best hope in accomplishing this goal is to gain friends in high places. Thus, if a wealthy person enters the assembly (or synagogue), they would offer them better seats and higher ground in the determination of legal decisions. But the author of James reminds them that their religion, the Christian faith, is not about gaining points with the rich but it's about loving neighbors and coming alongside the poor and those on the under side of the empire from whom they will gain nothing in return in terms of popularity points. "Neighbor" in this context, thus refers to those people who hold low or no standing in society. The heart of the law, the "royal law" (a term the irony of which we will discuss next), James reminds us, is not about establishing yourself, it's about loving your neighbor as yourself, as exemplified by Jesus. This defines the heart of faith in the God of Israel. Now, when the term "royal law" is used it implies, as some commentaries are swift to note, that this law being discussed is God's law and lies above the laws of Rome which indeed favor the rich over the poor. For God is the only real king. Now this sort of distinction would indeed set them back in their quest to establish themselves among Romans who embraced Caesar as the one true king but there is another dimension of irony to be discussed. The irony of the term "royal law" is found in the fact that it is meant in direct contrast to what the Romans would have considered "royal." 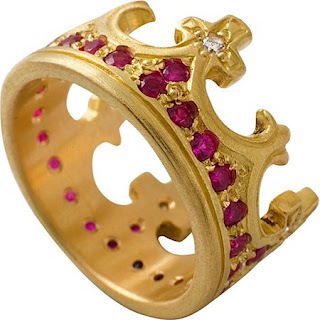 Not only would "royal law" would have been synonymous with Roman law, but the word royal itself raises images of "rings" and "fine clothes" and defiantly not the poor in "shabby clothes." To refer to the law of Leviticus 19:18 --a law which, as revealed in Jesus Christ, leans in the direction of the poor and the broken--as "royal law" is nothing short of subversive, for it flips upside-down our immediate conceptions of "royalty" and every image which that word carries. James reminds us that royalty is an illusion. The heart of the law is not in gaining ground or measuring up. It's simply in coming along side those in need and having a faith that not only lives in action but is also courageous enough to resist the temptation to favor those from whom we will receive something in return. Indeed that which we might receive in return from the rich is itself illusory. A logical analysis (found here: www.netzarim.co.il (that is the only legitimate Netzarim)) of all extant source documents and archeology proves that the historical Ribi Yehosuha ha-Mashiakh (the Messiah) from Nazareth and his talmidim (apprentice-students), called the Netzarim, taught and lived Torah all of their lives; and that Netzarim and Christianity were always antithetical. Judaism and Christianity have always been two antithetical religions, and thus the term “Jewish Christians” is an oxymoron. "Jewish Christians" is a term used by most scholars to distinguish those early Christians who were in fact Jewish but had embraced Jesus as the Christ thus bearing what we may now rightfully call "Christian" identity. This was before the days when Christianity was understood as anything other than a unique sect of Judaism. Therefore, no, "Jewish Christians" is not an oxymoron. As for what you call "Netzarim," you are right to say that those first disciples were still very much religiously Jewish. It took time for Christianity to really be seen as distinct from Judaism. But eventually it was, especially through the early teaching on the Holy Spirit and the subsequent openness of Christianity to gentiles.